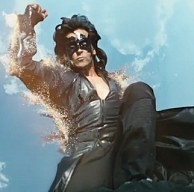 Hrithik Roshan's Krrish 3 entered the coveted 200 crores club for net collections in India, after turning in a handsome performance in its second weekend as well. The second weekend total net came to around 39.74 crores and the film's lifetime net in India stands at 206.35 crores. It has already breached the 3 Idiots mark of 202.47 crores net and only Chennai Express with a domestic net of 227.13 crores is ahead of Krrish 3. With the pace at which the film is collecting, it might turn out to be the biggest ever domestic grosser in a few more days' time. Krrish 3 is also the fastest entrant to the 200 crores net club as it took just 10 days to reach this mark, while Chennai Express took 15 days to reach this figure, a few months back. Hrithik Roshan and the director of Krrish 3, his dad Rakesh Roshan are meanwhile visiting Chennai today, to interact with fans and media in the city. The buzz surrounding Hrithik's visit is palpable!!! People looking for online information on 3 Idiots, Chennai express, Hrithik Roshan, Krrish 3 200 crores, Krrish 3 box office collection report will find this news story useful.